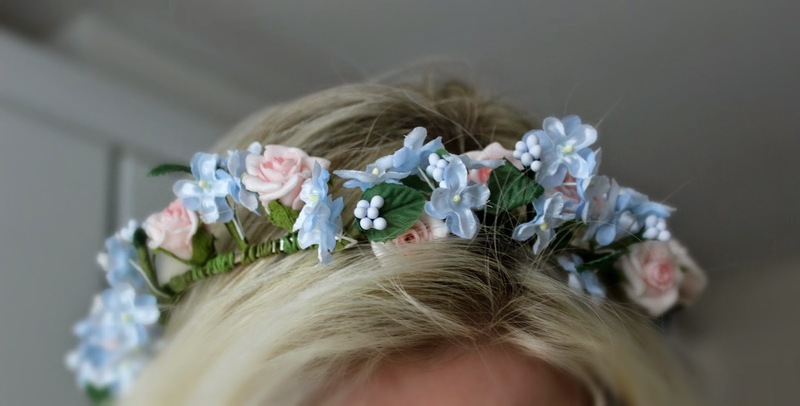 It's super easy to create this floral hair garland! All you do, is take one flower from the bunch, and literally wrap/twist it's stem around the headband. Try to make sure that the 'stem' is tightly wrapped around it, so that it doesn't fall off and move about, but also to make sure that there's no silver metal from the headband still visible. I then take a different type of floral decoration, and again, twist it around the headband just like the previous one. It's really just as simple as that! If I can do it, Anyone can do it! You also don't have to buy these from Hobbycraft if you don't have a local one, sometimes these cute little fake floral arrangements tend to be available from Poundland! It just takes a little bit of patience, and you will truly start to see it come together. I particularly LOVE the blue florals, as it also had that floral buds mixed in with the artificial leaves, which makes it look all the more detailed and realistic. Not only that, Hobbycraft have a massive range of diverse flowers in all shapes, sizes and colours. The reason why I went for these, is because they're unique, and they are pastel. Both on trend for this season, and just ultra stylish for those that aren't too daring with bright colours. This is the final, finished effect! I personally think that these look like the type of floral hair garlands that are sold in the likes of Topshop and River Island, instead of New Look or Primark which are just made using material. I managed to create this beautiful hair garland for a festival vibe, at the affordable price of £3.00! Would you wear this? Did you find this DIY helpful at all? Fabulous idea! Looks so easy to make & for a fraction of the price of High Street versions too. Love it! Such a good idea, I've been wanting another for a while now but dont want to have to spends loads to get one so I'll definitely be doing this! Such a good idea! This is SUCH a good idea!! So creative! I don't have a creative bone in my body so I'm not sure how mine would turn out, but it's be interesting to try haha! WOW! It looks so cute! I would totally wear this, and thank you for sharing this diy because it really helped! These are so cute. I love that you don't even have to use glue either, deceptively simple!